With amazing regularity I read newspaper articles and the likes, about workplace stress getting the better of workers and undermining maximum workplace productivity. These articles always put the blame on the stresses of the job, but I’ve noticed something quite interesting about stress and the seeming “weight of the world” bearing down on me, while still in my pajamas, most any weekday morning. My daughter bought me a digital scale for Christmas. Now, before you think that an unkind gift to give a middle-aged woman, please know that I asked for it, foolish woman that I am! As with any new “toy”, I found myself–somewhat sadistically, perhaps…especially over the holidays–standing on it many times per day, eg. very first thing in the morning, then after my shower, breakfast, lunch, etc., and even last thing at night (always a mistake!). Here’s what I’ve noticed…I’ve got the least amount of conscious stress, and I am my lightest, both literally and metaphorically, when I’ve just woken up and hopped out of bed. No sooner do I visit the facilities, have a shower, have a little breakfast…and read the paper…when the “weight of the world” begins to bear down. I can be almost two pounds heavier before even leaving the house for the day! Imagine that. Gravity. The world is pulling and yanking at me from the moment I go vertical! It just goes to show that, while the actual workplace, may indeed, be a primary source of daily stress, the “weight of the world” can bear down on us just by being awake. Can you relate? Better find ways to cope with all this yanking and pulling…and perhaps not bother to stand on your digital (or any other) scale quite so often! 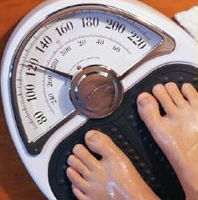 Merely standing on the scale can end up being a source of stress all on its own…and dangerous to your mental health. And who needs that?